It is clear that the business model for glaciers in our current climate is not working. 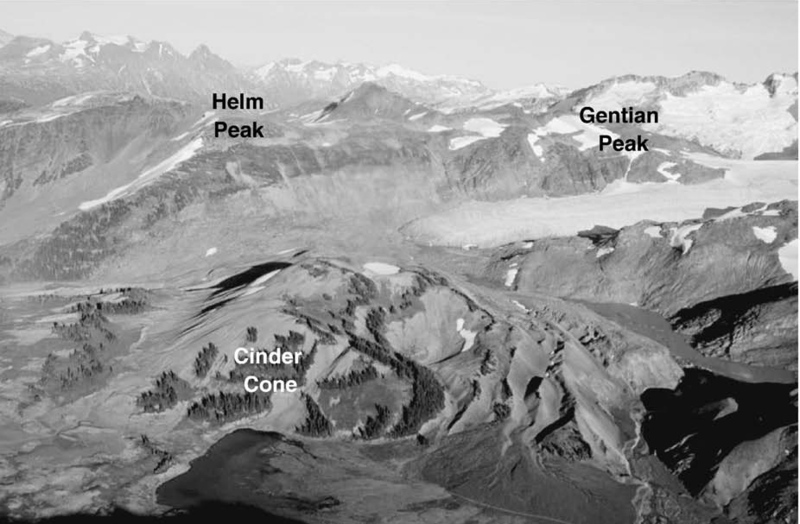 The Helm Glacier in the Coast Mountains of southwest British Columbia is an example of this. 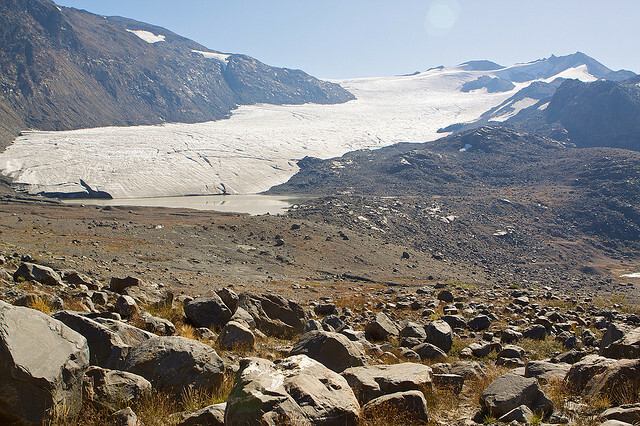 Helm Glacier drains into the Cheakamus River, which supplies Daisy lake Reservoir and the BC Hydro 157 MW Cheakamus Power Plant. The Cheakamus River has the Dave Marshall Salmon Reserve with over 14 kilometres of winding, re-enhanced salmon spawning river channels off the Cheakamus. 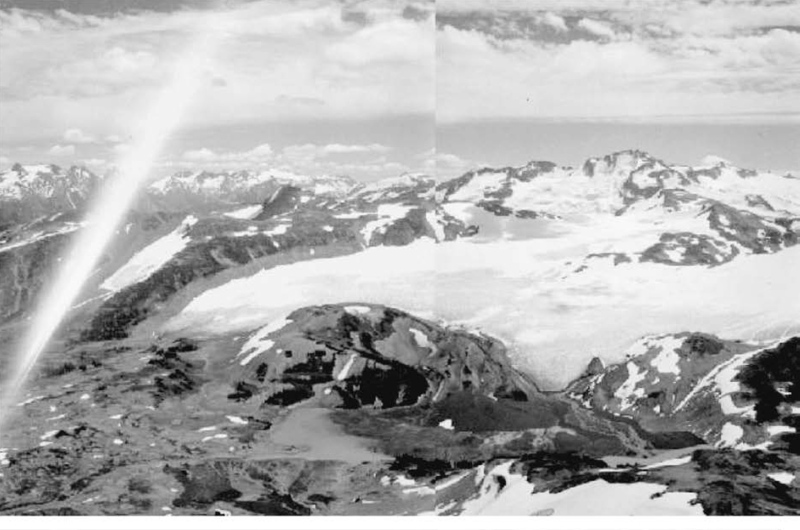 Helm Glacier has been the focus of annual mass balance surveys since 1967. 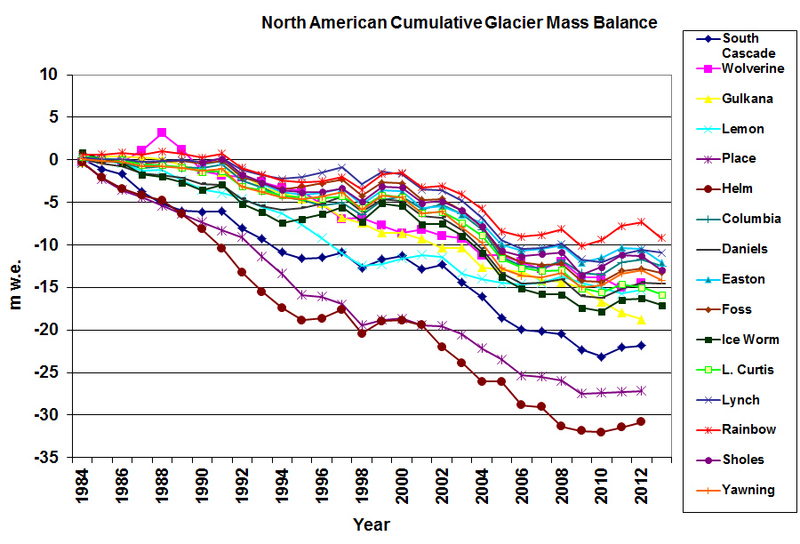 During the 1984-2013 period its mass balance losses have been the greatest of any of the 16 glaciers monitored in North America. The mass balance loss has been about 32 m of water equivalent, about 35 m of ice thickness lost. This is less than losses on other nearby glaciers like Big Bend Peak Glacier but more than others such as Stave Glacier. The regional volume loss has impacted even the large glaciers Bridge Glacier and small glaciers. The loss is more than 30% of the Helm lost in just 25 years, and the trend mirrors that of all glaciers in the Pacific Northwest. Helm Glacier also fits into the pattern of glacier retreat across Canada, Canadian Glacier Retreat index. The glacier had an area of 4.3 square kilometers in 1928. Today the area has declined by 78% to 0.92 square kilometers. In 1928 the glacier is not too distant from its Little Ice Age moraines. The trimlines of recently deglaciated terrain are clear. The glacier has two termini, one draining north and the other west. Today in the picture from Johannes Koch, there is a vast expanse of newly deglaciated terrain that as yet lacks significant vegetation. The western terminus is gone. Between 1977 and 1990, the west part of the glacier disintegrated into small cirque glaciers. Recession and melting of the Helm Glacier has been particularly rapid in the past decade. The thinning and retreat, has led to the main glacier separating from several small cirque glaciers that used to feed the glacier on its west side. The area of the main glacier has declined by 50% since 1996. More alarming has been the tendency of the glacier to lose its snow cover almost entirely as has occurred each year from 2002-2006. This progression of events is mirrored by Galaxy Glacier further east in Garibaldi National Park. In 2009 the glacier again lost its snow cover and seen in the following Google Earth image, in addition a bedrock area has been exposed (point A) near the top of the glacier indicating thinning in what should be the prime accumulation area. The glacier is clearly a fraction of its former self compare to Little Ice age margin in orange.The accumulation area ratio AAR reported to the World Glacier Monitoring Service was 0 % from 2002-2006. In 2009 the snowline is shown as blue dots, this is still in early September with another several weeks of melting to go. In 2013 the snowline was quite high on Sept. 12 indicating another low mass balance. To be in equilibrium a glacier typically needs 50 % of its area to be snowcovered at the end of summer. Without an accumulation zone the glacier cannot survive. the glacier has retreated 1100 meters in the last century. In the last 50 years the retreat rate has been 15 meters per year. The retreat has exposed trees overrun by the advance of the Helm Glacier. There are some younger trees dating from the 12th to the 16th century overrun by the glacier advance. The sixteenth century wood location is fairly close to its Little Ice Age maximum, Koch and others, 2007. 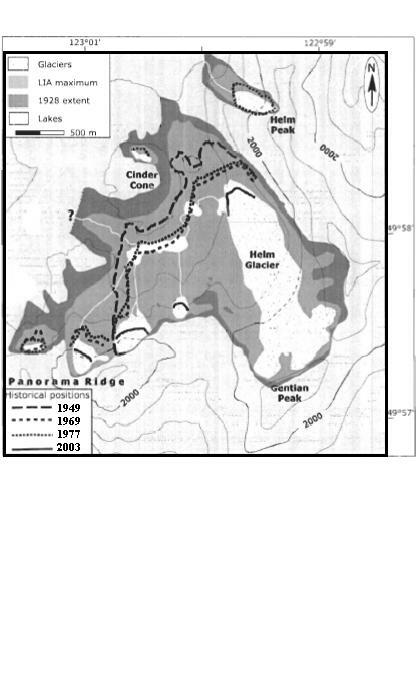 The locations of the wood samples are mainly arrayed around the cinder cone exposed by retreat between 1940 and 1980. Older trees discovered in 2006 and 2007 by more recent retreat were killed 6400 years ago, trees dated We have gone from a glacier at its smallest extent in 1000 years, to its smallest extent in 7000 years and still retreating in the a short period. The map below from Koch and others (2009). The lack of a consistent accumulation zone in recent years suggests this glacier will not survive. A glacier must have a consistent and persistent accumulation zone to endure. In the Google Earth Image below the Little Ice Age moraine from the Helm Glacier complex is indicated in red. Point A indicates a location between two prominent wind features. The wind features do not represent areas of deeper annual accumulation in this case. The features are aerodynamic and once they achieve a certain height the remainder of the snow is blown off of them. That rock is exposed between the two indicates that there is little to no glacier flow from the top drift feeding the glacier. Point B indicates the snowline, this is not the end of the summer though this is July 20, 2009. By the end of the summer the glacier will have lost 95% of its snowcover. 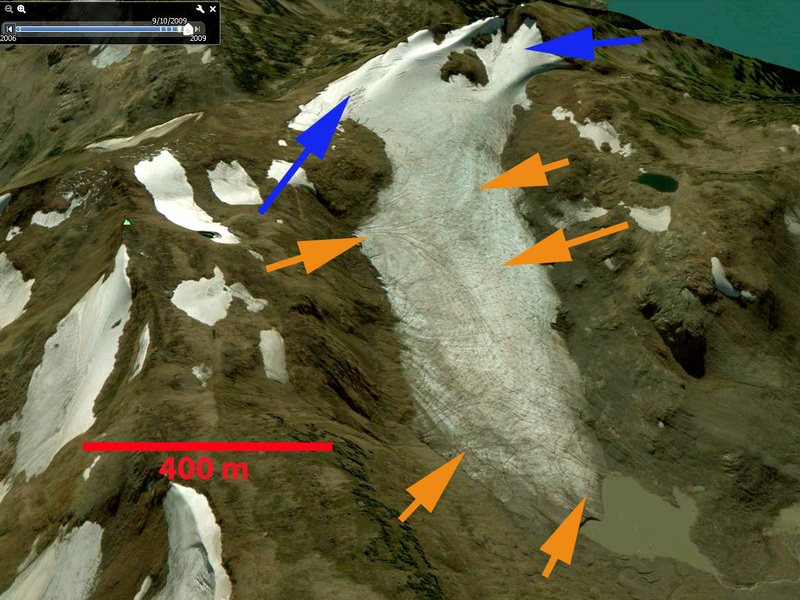 An image from 9/10/2009 indicates this, blue arrows indicate remaining snowcover and orange arrows indicate features of stagnant ice. The terminus is thin and uncrevassed. on the left of the glacier in the image are two set of crescentic crevasses indicating collapse into basal depressions. There are no transverse crevasses below the snowline indicating significant movement towards the terminus. Both factors indicate the lack of a consistent accumulation zone that will allow survival. At this point the loss will likely occur more via downwasting than by terminus retreat. The glacier certainly does not look active in the image from Marlowe Northcott in 2009, second image below. This glacier like nearby Icemantle Glacier, Stave Glacier and Snowcap Creek Glacier is losing volume rapidly.